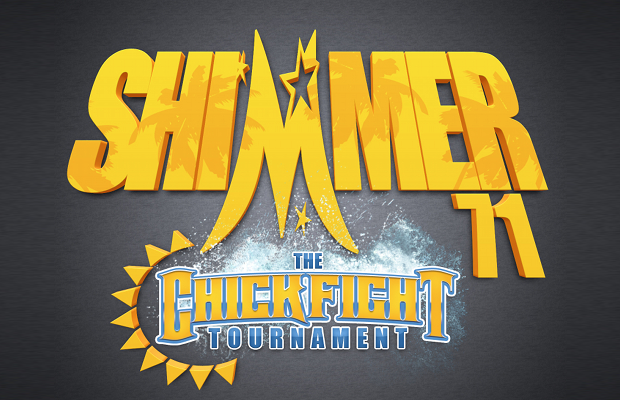 Diva Dirt presents live coverage of SHIMMER 71: The ChickFight Tournament, airing this afternoon on iPPV. The show will feature a 12-woman tournament, with the winner being granted a future shot at the SHIMMER Championship. Also on the card is a SHIMMER Championship defense by Nicole Matthews. She will put the belt on the line against Tomoka Nakagawa. SHIMMER 71 comes to us live from the Santa Clara County Fairgrounds in San Jose, California at 3pm Eastern (12pm PT) and live on iPPV. Click here to order the show. Evie def. Portia Perez with the TTYL after interference by Nicole Matthews backfires. Nicole Savoy def. Candice LeRae with a tiger suplex. Nikki Storm def. Cherry Bomb with fisherman’s neck breaker. Kay Lee Ray def. Kimber Lee with a reversal into a crucifix pin. Mia Yim def. Athena after hitting a package piledriver followed by a 450 splash. Cheerleader Melissa def. Havok by pinning her with her feet on the ropes. Evie def. Nicole Savoy with a double stomp. Kay Lee Ray def. Nikki Storm with a Gory bomb followed by a Swanton bomb. Cheerleader Melissa def. Mia Yim via DQ when Havok interferes and attacks Melissa. Kay Lee Ray def. Cheerleader Melissa and Evie in a Three-Way Elimination match. She has earned a shot at the SHIMMER Title in two weeks at the next SHIMMER weekend tapings. SHIMMER Championship match: Nicole Matthews def. Tomoka Nakagawa to retain the title after hitting her with a steel chair brought to ringside by Portia Perez. Matches from SHIMMER 71 will soon be available on ClickWrestle.com.